The newly completed Aurora Police Headquarters and Branch Courts by Cordogan, Clark & Associates with McClaren Wilson and Lawrie, nationally recognized specialists in architecture for law enforcement and forensic sciences, features state-of-the-art technology, substantial increases in the amount of physical space, and sustainable architecture designed to LEED Gold Certification standards. During its construction, the new headquarters was the largest, full-service municipal police department under construction in the nation, and the largest civic building being constructed in Illinois. The complex contains a 154,000 square foot Headquarters Building, a 41,000 square foot Training & Support Building, and a 500-space parking structure. The new headquarters facility houses a high-tech detention facility, emergency 911 center, records division, administrative offices, and the Kane County branch court. This building replaces the dilapidated police building that could no longer adequately accommodate the ever-growing police force and required hundreds of thousands dollars annually for age-related maintenance issues. “The new facility will not only allow the space and professional environment to help the department protect the citizens of Illinois’ second largest city, but also it features the most advanced technology available to law enforcement today,” says Chief Thomas. Previously in Aurora, five separate police facilities housed the programs that are now housed in just the new Police Headquarters building. A large portion of the officer training took place off site, wasting time and money. Now, five rooms on the third floor of the new facility are dedicated to training and contain state-of-the-art communication equipment. In addition, the adjacent Training & Support Building holds a firing range, Special Response Team classroom and storage space, evidence storage, forensic examination labs, and a secure garage for officer’s cars. 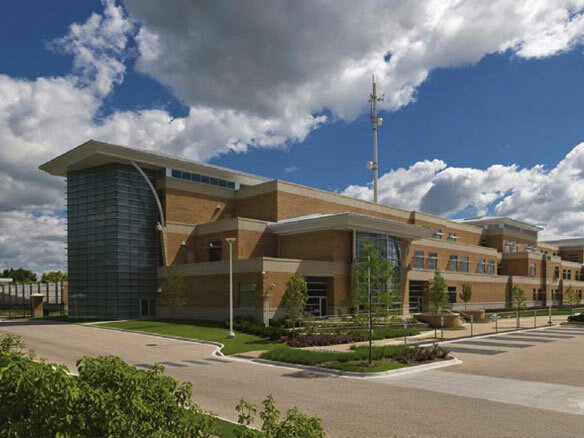 Although the new Police Headquarters features more services under one roof than the old facility, design strategies increased the security and safety of officers and civilians in the building. For instance, unlike the old building, the entrance to the Kane County Branch Court is separate from the police headquarters. In the past, more than 1,000 people could attend court in a day, creating massive parking and security issues. Now these issues are relieved by the parking structure and separate entrances. The new court services area is a user-friendly environment with twice the capacity of the old courtroom. On the police services side, the nested “U” configuration of the detention cells provides safety and security for officers and support staff. This arrangement allows all mechanical servicing to be performed in the outer corridor, and all food to be served through an opening into each cell, thus eliminating the need for personnel to enter cells occupied by prisoners. The new Aurora Police Headquarters fully embraces state-of-the-art technologies, and is the first municipal jail to have flex dorms. Based on state law, detained men, women, and juveniles are not allowed to come in contact with one another. This would typically require three separate detainment areas for each group. However, by using smart glass for the cells, the prisoners can now be in the same area, side-by-side, resulting in huge cost savings and a significantly smaller footprint. The smart glass is electrically controlled liquid crystal glass that changes from transparent to translucent through the simple press of a button. The Police Headquarters also takes advantage of on-site renewable energy technologies and conservation techniques. Its “Green Design” features include photovoltaics, green-roofs, optimized day-lighting, water efficient landscaping, permeable pavers, and innovative wastewater techniques. The new facility is designed to use 30% less water and 27% less energy than a similar sized building. It is pending LEED Gold certification.